This week I started working on a new project - I am painting a mural in the nursery at my church. Hopefully it will brighten the room up for the kids (and adults) who use the room every Sunday. 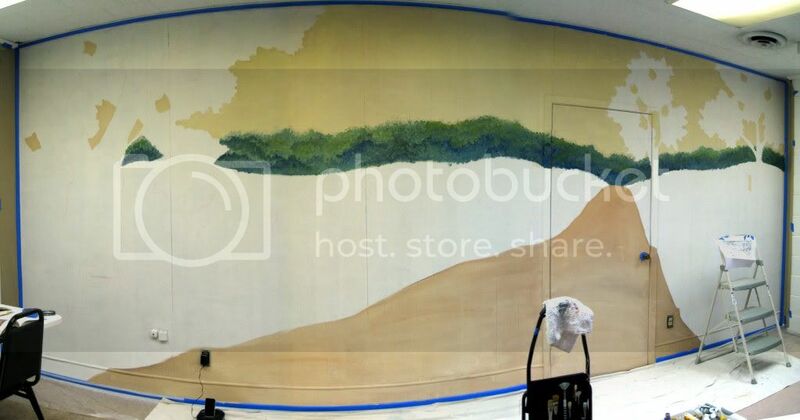 I thought I would post a few "in progress" pictures over the next few days so you can watch the mural take shape. Then, on Tuesday I started painting - the fun part! I didn't take any "before" pictures - but you aren't missing too much by not seeing that - it was simply a panelled wall covered in white primer. I sketched out some basic shapes in chalk, then started painting in the first layer of background colors. I am going for a "vintage storybook illustration" feel, so I'm using more subdued colors than I did in some of my previous murals. The photo below shows my progress after several hours of work. The wall is actually flat, although it looks like it's curved or bulging here - I was using the "stitch" feature on my camera that allows you to piece together several photos into a panoramic view - a handy tool for tight spaces, but it tends to distort the lines a bit. The first day or two of a mural project (for me, at least) consists of plotting out where everything's going to be, and then blocking in large areas of background color. The details will come later - right now it's about getting a layer of paint on the wall. A little boring at this stage, but you can see it's starting to take shape. Stay tuned for more - I'll keep you posted on the progress! Hope you're having a lovely week - I am! oh it is looking great! i love your cdo issue :)...that was funny. i dont have this as i am as disorganized as they come. i love the mural. i have always wanted to do one in my house. have a great week painting! Looks pretty wonderful to me so far! Envious of your workspace. And thanks again for the needlefelting tutorial.